A heavy dose of organic dark chocolate, cocoa powder and fresh walnut pieces makes our Brownie bar the perfect companion for any chocolate lover. Warming this one up in the sun for a while is never a bad idea. Just make sure you have a big glass of coconut milk on deck to wash down all that ooey gooey, chocolatey goodness. Chocolate Brownie was created primarily from a place of social obligation. To satisfy the most primitive desires of any chocolate lover. 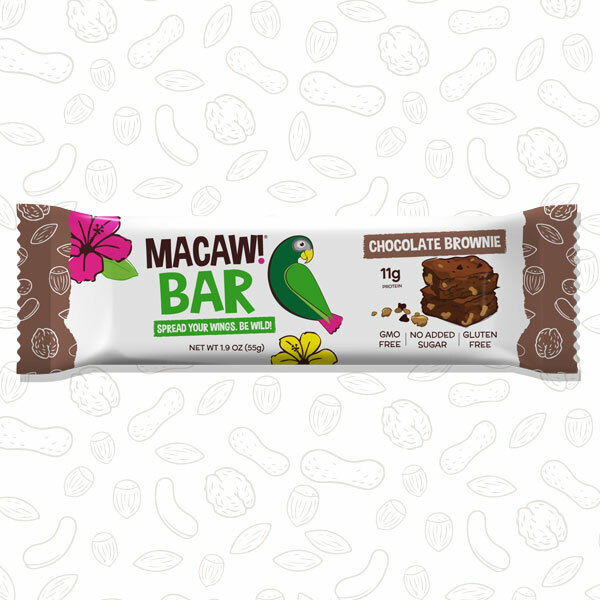 With the inclusion of organic dark chocolate chips already in all Macaw! Bars, it didn’t take the addition of many ingredients to bump up our confectionary game on the Chocolate Brownie recipe. As kids, I think most of us can remember waging war against the deliberate sabotage of a perfectly good dessert. For that reason, arriving at the final decision to include walnuts in our Chocolate Brownie, was not easy. A rare act of defying our inner child, here at Macaw! Foods. Once you take a bite of our Brownie, I think you’ll realize it was a justifiable exception that we can all agree upon. With it’s rich creamy characteristics, organic cacao powder winds up tying everything together on this one. Walnuts included. Originally dubbed “Brownie Batter”, the name was updated to “Chocolate Brownie” as the result of a strategic split test here at the Orlando Farmer’s Market. Despite its allure when presented on a spatula or egg beater, we discovered the term “Brownie Batter” to be confusing and less appetizing when applied to something that does not in fact, need to be baked in the oven. 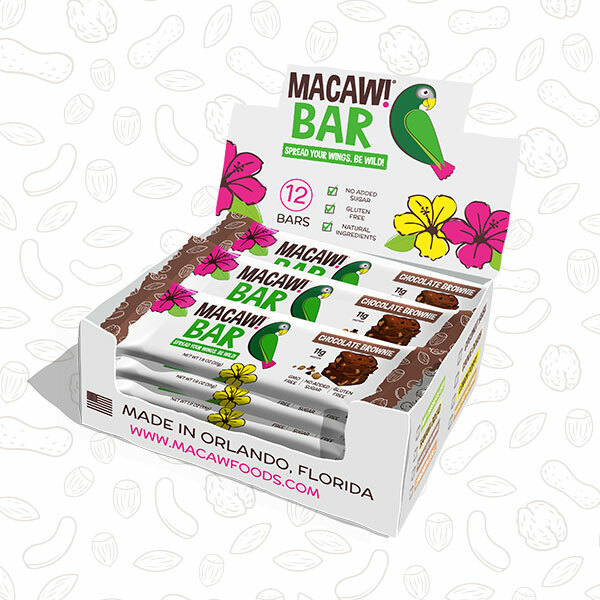 ORGANIC DATES: We use a fresh organic date paste as part of the base of each Macaw! Bar. In order to keep the bars a consistent texture, we had to search for a paste that is a specific moisture level. ORGANIC CASHEW BUTTER: After years of experimentations we finally found the perfect cashew butter. The key to getting the right Macaw! 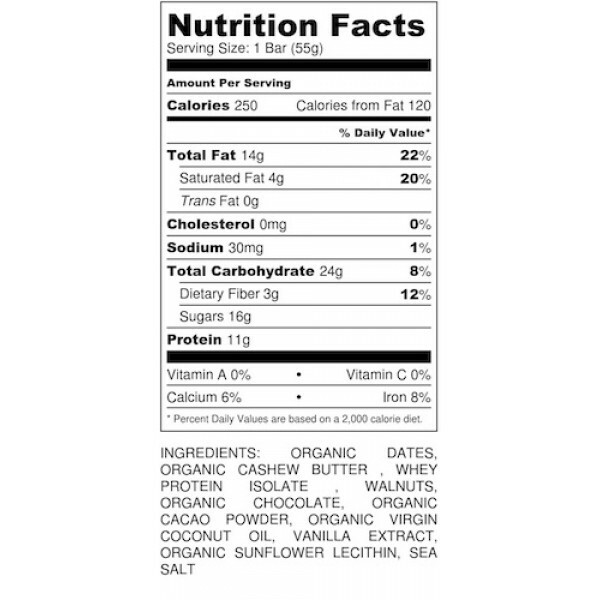 Bar texture is using a cashew butter that doesn't have excessive oil levels. WHEY PROTEIN ISOLATE: Provides excellent levels of quality protein that the body can digest easily. It's as pure and clean as can be, and right out of Minnesota, USA! WALNUTS: Crunchy and flavorful, straight from California, USA! ORGANIC CHOCOLATE: Dairy-free dark chocolate chips make this bar hard to resist. ORGANIC CACAO POWDER: Raw cacao powder is high in antioxidants, and brings out a powerful chocolatey flavor. ORGANIC VIRGIN COCONUT OIL: In addition to providing a healthy source of energy, coconut oil helps keep the bars a chewy and moist texture. VANILLA EXTRACT: Really enhances the flavour of all Macaw! Bars. ORGANIC SUNFLOWER LECITHIN: This ingredient doesn't affect the flavor, but does ensure a fantastic consistency in every batch. SEA SALT: A small sprinkle of sea salt is all that's needed to really bring this bar together.